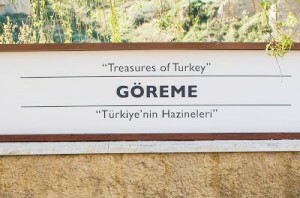 Göreme Open Air Museum is 14 km (9 mile) far to Nevsehir centurum. Located in the Göreme Historical National Park, the museum consists of churches and monasteries of various sizes made with the carved soft volcanic rocks. It is also possible to see the byzantine church architecture and religious architecture in this area. Houses of worship were constructed on valley and stream beds where they would not be noticed easily. Having been carved in the rocks, these houses of worship are like small seclusion rooms. Once the adoption of Christianity became a free choice, religious structures located in Göreme and its vicinity became significant examples of the byzantine church architecture instead of hidden seclusion rooms. This museum which was opened to visit as “Outdoor Museum” in 1950 is the biggest outdoor museum of our country and in the 3rd place among the most visited museums. Churches which can be visited in the museum are Apple Church, Dark Church, Buckle Church, Snake Church (Saint Onup/Irius Church), St. Basil Chapel, St. Barbara Chapel and St. Catherine Chapel, etc. One of the most prominent buildings in the area with its vivid colors, the church is a groin-vaulted structure with cross-in-square plan, having four columns and a central dome. 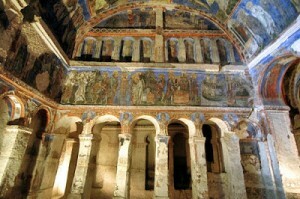 It has beautiful frescoes dating to the 11th and 12th centuries. And where these have fallen off, you can see simple red-painted ornaments from the iconoclastic period. The frescoes are narrating scenes from the Bible and the life of Christ, the Hospitality of Abraham and Three Hebrew Youths. The building derives its name from the apple orchard collapsed a long time ago, in front of the main entrance. This church has a linear plan, consisting of two chambers. The front section is barrel-vaulted, while the back one has a flat ceiling. The red ochre ornaments imitate hewn stone plait. Frescoes dated to the 11th century, are painted directly on the wall. Opposite the entrance, there is an image of Christ with a book in his hand, and at his left, on both sides of a large cross, are Emperor Constantine and Helena. Right next to it, the Killing of the Snake by St. George and St. Theodore is depicted. On the opposite wall, Onophrios can be seen with a sapling in front of him, also the Apostle Thomas, and the founder of the building, St. Basileios holding a book in one hand and sanctifying with the other. The entrance to this church is from the north through a winding tunnel which opens into a barrel-vaulted narthex. You have to pay an extra admission fee (8 TL per person) but it is surely worth it. In the south of the narthex there are three graves, two of which are big and the other, small. The church has a cross plan, the arms of the cross having a diagonal vault. The templon of the main apse has been destroyed. This Church dates to the end of the 12th century. Some of the scenes on the walls are Deesis, Annunciation, Journey to Bethlehem, Nativity, Baptism, Raising of Lazarus, Transfiguration, Entry into Jerusalem, Last Supper, Betrayal of Judas, the Crucifixion and Anastasis. This two columned church (two other columns being in the form of pillars), is cross vaulted, and has three apses and four domes. The well preserved frescoes show the life of Jesus, Hospitality of Abraham, and images of the saints and the donors of the church. Although it resembles both the Karanlik (Dark) and Elmali (Apple) Churches, the scenes of the Way of the Cross and the Descent from the Cross make this church different from the others. The figures are generally large. 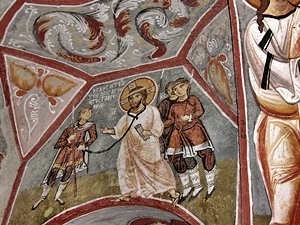 The footprints under the Ascension scene give the church its name, which means “with sandal”. The church dates back to the end of the 12th and the beginning of the 13th centuries. 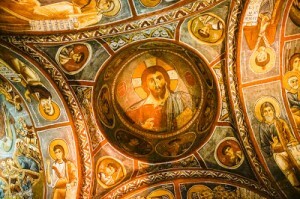 The center dome houses a picture of Jesus the Pantocrator with the busts of angels in the insets. On the central apse is Deesis, on the north apse Mary and the Baby Jesus, and on the south apse, a picture of St Michael. Even though Tokali church is located down the museum around 50 meters, you can visit the church with the same ticket that you used for Goreme Open Air Museum. It is a complex made up of 4 main chambers. The entrance to the New Church having a rectangular plan with longitudinal axis is made through the barrel-vaulted single-naved Old Church. This rock settlement is divided with arches into three sections. Containing the most important samples of paintings, the building has been decorated in various periods. Please contact us for further information and booking Goreme Open Air Museum. Came to Cappadocia for 2 days, but it was not enough! Our tour guide Hamide along with our bus drive Mehmet was the best. Hamide is by far the best tour guide I have had during my 11 day Turkey trip. Her knowledge, humour and enthusiasm is just so entertaining! I wish I could take her along with me so she could be our guide for the rest of my trip. If I ever come back to Cappadocia, I will definitely be searching Kairos Travel.